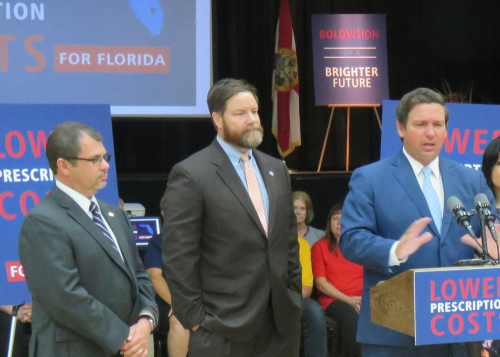 Governor Ronald DeSantis came to SCC April 8 to deliver a message about his initiative for lowering prescription drug costs. Two bills that support that effort have been introduced to Florida legislators: Senate Bill 1528, sponsored by Senator Tom Leek, left, and House Bill 19, sponsored by Florida Representative Aaron Bean, center. Governor Ronald DeSantis visited Sun City Center April 8 to deliver remarks about health care initiatives for Florida residents. In introducing him to the residents, who had gathered at Community Hall, Mary Mayhew, Secretary for the Agency for Health Care Administration (Florida), commented about her agency’s commitment to drive down costs: “Governor DeSantis’ leadership, particularly his efforts to bring down the exorbitant costs of prescription drugs, is going to help us make that happen,” she said. The Governor’s remarks concentrated on that message. “I asked my folks what we could do at the state level to bring costs down,” he said. He went on to say that bringing drugs in from Canada is one of the things that surfaced as important. Drugs from Canada cost a fraction of what U.S. suppliers charge. That prompted Gov. DeSantis to talk to President Trump, who told him to tell Floridians he supports efforts to allow them to buy imported drugs. Two bills have been introduced in the Florida legislature—Senate Bill 1528, sponsored by Senator Aaron Bean, requires the Agency for Health Care Administration to establish the Canadian Prescription Drug Importation Program. House Bill 19, sponsored by Representative Tom Leek, creates the Prescription Drug Importation Program. DeSantis said that passage of these bills through the Florida legislature would move his initiative forward and ensure that Florida residents benefit from lower costs, while being assured that the drugs imported are safe. “This whole idea that Canada is a third-world country—give me a break!” he said. DeSantis said he recognized that there would be opposition and thanked Leeks and Aaron, who accompanied him to Sun City Center, for their leadership. Rep. Leek addressed the audience, saying, “We hear so much about the high cost of prescription drugs. We will be working closely with sponsors, both houses and the FDA to allow drugs from Canada through the U.S. system. By the time we are done, we will be able to give you the benefit of safe, imported drugs.” He said a secondary benefit would be that consumers could acquire their drugs from local businesses. 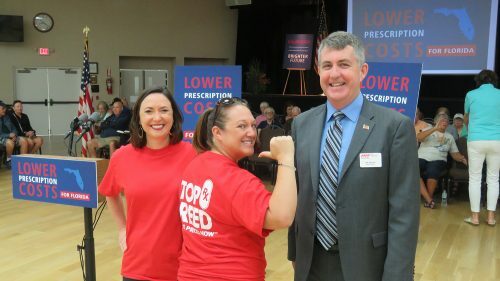 AARP State Director Jeff Johnson was on hand at the DeSantis gathering, along with Associate State Director of Advocacy and Outreach Laura Cantwell, left, and Associate State Director for Outreach & Advocacy—Tampa Bay’s Michelle Cyr. Senator Bean had high praise for DeSantis’ efforts. “He’s making this bold move to allow new sources of drugs so we can enjoy the savings others in the world enjoy,” he said. Bean related an example about a friend with MS who takes “a magic drug for MS” every day. In Canada, that drug costs $11.90 a day; in the U.S. it costs $119 a day. “That is unacceptable,” said Bean, who then lambasted the drug companies for hiring the majority of lobbyists in Tallahassee. Bean also commented on the fact that AARP is strongly supporting the Governor’s efforts to lower drug costs. A dozen or so AARP representatives from offices in St. Petersburg, Tampa, Doral and Tallahassee were on hand to demonstrate their support. DeSantis, an attorney and former Naval officer, has been serving as the 46th governor of Florida since January 2019. A Republican, he represented Florida’s 6th congressional district in Congress from 2013 to 2018.